You’re driving to work one morning, drinking the delicious coffee you made. You’re imagining your day will be perfect because it’s started out with a cup of coffee that tastes a bit like heaven. As you merge onto the freeway from the onramp, it happens. A dump truck full of gravel barrels by at freeway speed. You hear the glittery crack agains your windshield and suddenly, the crystal clear view ahead has been marred by a small chip in your windshield. This rosebud of a divot is directly in your line of sight. It begins to flash irritatingly in the morning light. Great, your day just lost a little bit of sunshine. The coffee’s sweetness taints with a slightly bitter taste. You think, “I’m going to have to replace the windshield.” You imagine dealing with shady glass repair shops, windshield replacement prices, and insurance premiums turning stratospherically high. Not to mention a possible leaky windshield. And worse, some insurance companies don’t cover rock chip damage. Now what? Before you give panic and decide to see how much you’ll get for your car with a title loan to replace the windshield, examine the crack. You may be able to fix the chip in your windshield yourself. Not only saving money, but you could be earning major points with your spouse for being so ingenious. It’s a matter of applying epoxy to the crack, giving it time to dry, then buffing out the extra. It’s not very hard and with these steps, you’ll be sure your DIY is successful. If you look at the glass in your house, it’s great for solid structures that reach too high of a velocity. Okay, the hope is that it NEVER reaches any velocity. It’s strong, clear and relatively cheap to buy. The problem with this type of glass, when a rock hits it, is it shatters easily into long, spindly spears that can cause extremely serious, if not fatal damage to any living thing that happens to be standing next to it. Even the side windows of a car have different than the front windshield. These windows are made of tempered glass that is a super strong alternative to the other glass and tends to shatter into tiny pieces when broken. While they are still sharp, the idea is that they would cause less damage to a human being than any of the others. 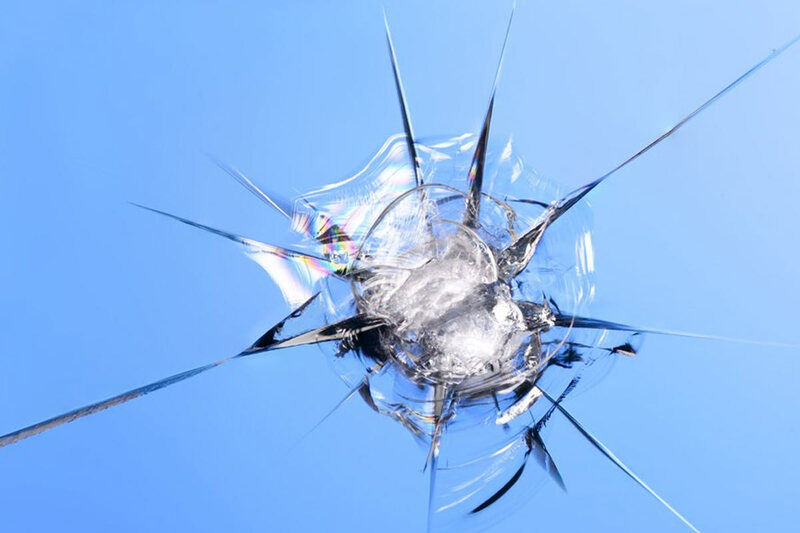 But windshield glass is different because tempered glass wouldn’t withstand the constant barrage of materials that crashes into a windshield constantly. So automakers came up with a layered glass for the front windshield we know and use today. It’s made by sandwiching a resin layer with two pieces of tempered glass. This piece of material is super charged because it’s purpose is multifold. If the outer tempered glass happens to be hit with small pebbles, it will create a divot, but it probably won’t shatter because the inner resin layer acts as a shock absorber, preventing this from happening. Thus, chips are made. The danger of a deeper chip that exposes the resin is that this flexible layer is exposed to the elements and can lose it’s flexibility. This reduces the safety factor significantly and the outer layer tends to crack more until your windshield looks like spiders took over between the layers and created their own art. Your first step is to purchase a windshield crack repair kit. The more inexpensive kits can be purchased at Walmart, Target, or Sears. It’s recommended, if you can afford it, to got to an auto parts store like Autozone or O’Reilly’s. Most kits are less than $20, so don’t expect to spend much more than that. While each repair kit has it’s own special instructions the basics are the same and relayed here. Make sure your windshield is completely clean and dry before you begin. You also need to make sure your windshield is around room temperature. That means if it’s a rainy, cold day, you should probably try to find a heated garage or cover and use a blow dryer to warm the windshield. Some kits contain an adhesive and single fluid filled syringe. Peel the backing from the adhesive layer and center it over the crack, smoothing out any of the edges and making sure the adhesive sticks to the crack. Take the applicator section and push it into the adhesive making sure it completely covers the crack and is stuck tight. Now hold the syringe so the point is up and remove the tip. Don’t tip it sideways so you don’t end up with clear adhesive stuck to your hood or quarter panel. Have a timer handy so you can easily reach it with one hand. Use your watch with a second hand if you don’t have anything else. Attach the syringe to the adapter. With one hand on the syringe to steady it, pull the plunger back slowly as far as it will go and hold it there. Set your timer for one minute and start it. You’ll still be holding the plunger out because it’ll want to release. Watch as the bubbles from inside the crack slowly raise out and go toward the end of the syringe while the adhsive takes it’s place inside the crack. After the timer goes off, quickly release the plunger and allow it to snap back down. This forces the adhesive deeper into the crack. Repeat this process four or five times until you’re completely sure all the air has been replaced by the adhesive. Remove the syringe and adapter from the windshield. You will see that adhesive is spread around the outside of the chip. You may remove the excess from around the chip using an alcohol cloth. But don’t remove the small bit of adhesive sticking up from the chip hole itself. Leave that for now. Go have lunch or dinner and let the adhesive cure for a couple of hours. Once you’re sure the plug has hardened completely, you can take a sharp instrument like a knife and shave the extra adhesive from the windshield so that when you’re done it’s flat when you rub your finger across it. Now all you have to do is buff the area with a cloth for a few minutes until the repair is no longer visible. This method allows you to save money and have an almost new windshield in half a day. Much better than having an auto glass repair shop take two or three days to replace the whole thing.